Yet despite his disability, he continues to provide for his family by being a coconut farmer, climbing up to 60 trees a day. In the Southern Leyte province in the Philippines, five-year-old girl Jenny has an important task. Everyday she has to guide her father to work with the help of a wooden rod, walking through miles of uneven terrain. Why? Jenny’s father, Nelson “Dodong” Pepe, is blind. Yet despite his disability, he continues to provide for his family by being a coconut farmer. For a person with a disability such as his, his work is dangerous; it entails climbing up to 60 coconut trees every day. For his efforts, he receives only 300 pesos, roughly $6. The father-daughter’s daily routine was captured on film and uploaded on Facebook by user Rhuby Capunes. Since the video went up, it has accrued at least two million views. In the video, it shows little Jenny holding one end of a wooden stick while her father holds the other. 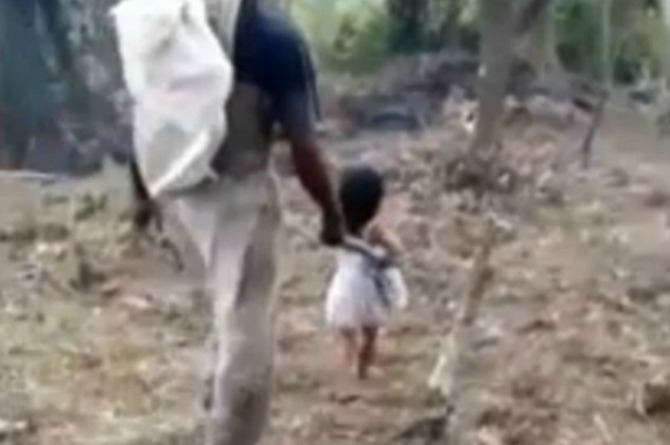 Walking barefoot, she uses the stick to steer her father in the right direction. At one point in the video, the pair stops for a water break, with Jenny handing her father a bottle. Jenny doesn’t mind that she has to walk her father everyday in fact the little girl even looks happy doing it. After the video made international headlines, a foundation in the Philippines visited the province to meet with the pair. Now the foundation aims to help them relocate to a different, much safer place. In fact, the foundation even flew Dodong to the country’s capital, Manila, to have his eyesight checked. He was diagnosed with retinal detachment and retinitis pigmentosa, both of which caused his loss of sight. Dodong will also undergo a “livelihood training” to further help his family. Here's why Yuvraj Singh's father Yograj won't attend his wedding!